I know modding isn't officially supported yet, but I'm still hoping to both get things moving to make it possible for the game (mostly cosmetic I'm guessing) and to get some of those awesome creatures and characters made into Torchlight 1/2 mods. Let's combine our skills and see what we can do! 1)	Virtually all bonus damage is additive. If you find an item with +20% melee damage, for instance, or +10% all damage, it’s not going to multiply your current damage output by 1.2 or 1.1, respectively. The damage bonus will add to all the other bonus sources you may have, and only then will the resulting total be applied to your base damage. 2)	Fumbles only happen on auto-attacks, not on skills. 4)	DoTs don’t crit. Nope. 5)	Weapon-based critical hits always deal maximum damage. Surprisingly, I haven’t seen anyone mention this here yet though it’s both rather huge in terms of optimization, and pretty glaring when you look at the combat log. This holds true for auto-attacks and all skills wased on weapon DPS. -	sources of direct applicable bonuses like +10% all damage, +35% fire damage, +20% ranged weapon damage, etc. 2) The speed bonus is either attack speed bonus (if it’s a weapon attack) or a cast speed bonus (if it’s a skill). Some skills have a cooldown, and as far as I know they never benefit from casting speed bonuses in terms of damage per second. Others are channeled (their mana cost is expressed in mana per second): some of them do benefit (Arc Beam, Shocking Burst for instance) from cast speed bonuses, but others don't (Magma Spear); at this point I'm not sure why, and I don't have a full list. In all cases, however, cast speed does accelerate the wind-up animation, so the spells do come out a bit quicker. Attack speed does benefit skills based on weapon DPS indirectly, in that increasing attack speed increases weapon DPS. 3) Critical hit chance for skills is actually often not the one you see in the Arcane Statistics panel. For skills dealing a percentage of weapon DPS, it is usually your normal crit chance multiplied by this factor. For other skills it's a different hidden value that needs to be figured out (or fished from game data files). For instance, each pillar of Ice Prison has a ~75% adjustment to its crit chance when shattering. 4) The next expression is the increased damage from critical hits, assuming critical hits are based off the normal base damage range. Since weapon-based crits always deal max damage, this expression is in fact wrong for thos type of attacks but it's just simpler to visualize like this anyway. 5) The last expression is fumbles. Fumbles only happen on auto-attacks, so u is a special variable equal to 1 for auto-attacks, and equal to 0 with skills. Since fumbles and crits are separate events, this expression is technically wrong too - again, it's simpler to explain the concepts this way. 6) Base dps here can be a great many things. Yay for science. Pay attention to the nested parentheses, it’s a bit hard to read on screen. Crit_dps is basically the same as base_dps for flat-damage skills (e.g. Hailstorm), and is the maximum damage in the range for weapon-based skills (e.g. Flame Hammer) and auto-attacks. There are many affixes on gear that can impact the equation above (poetically named “(2)”). -	here’s where it gets neat: what happens with stuff that adds fixed damage? Well, thanks for asking. It depends on whether it’s a weapon socketable (or a weapon enchantment) or not. If it is, the added damage value gets added to the base weapon damage per hit. This is huge, because if you add a Skull of Vellinque (+199 physical damage) to a weapon that deals 100 damage per hit, you’re essentially tripling the total DPS (give or take). Bear in mind that if you add elemental damage such as from Embers, it gets bonus damage from Strength AND Focus (and all other applicable bonus sources). The flip side is that if you’re using a flat-damage skill, your weapon is irrelevant and so is this socketable. If it’s not a weapon socketable/enchantment, then it ****. Not that I’m judging. The fact is, it gets no bonus damage whatsoever. That +173 ice damage necklace basically adds 173 ice damage to your final damage number before fumbles and crits, but that’s it. You could have 2000 Focus and you’d still only get +173 ice damage, even with skills. Note that the bonus damage from Sword and Board works like this too, making it IMO the most useless skill in the game. 1) Skills that are NOT based on weapon DPS do not transmit any active effect (i.e. DoTs, % chance to cast spells, armor debuffs, etc.). 2) Skills based on weapon DPS may transmit some, but it depends on the effect and on the skill. Armor debuffs from weapons or socketables do stack with themselves too. More interestingly, the "% chance to flee" debuff (which I assume works like other "chance to inflict X" affixes) seems to stack too, though I have no idea how that works: if you hit the dummy with a "10% chance to flee" weapon, once every few hits it'll get a little icon that says "10% chance to flee". If it gets that effect applied again, the icon will be upgraded to 20%, then 30, etc. At face value it's like you have a chance to inflict a debuff that has a chance to cause the target to flee; my guess is that the game is just acting up a bit and the 20/30/40% chances just mean the "fleeing" debuff was applied while it was still active from a previous hit. Serguei's equipped with two Corbucci's rings, a pair of Steam-Tech Nines, and 6 pieces of the Labarinto set (which is, incidentally, ugly as ****). The Tec9 deals 119 average physical damage, 119.5 average ice and poison damage, and has an attack speed of 0.64. Serguei has 6% increased attack speed. 7. Further testing reveals that none of the numbers above, including DPS, take fumbles into account. Testing monster armor is a flying pain the **** for a couple of reasons. First, there's a range of damage reduction, so instead of straight numbers, you've got to deal with averages and mins and maxes that you're never sure you've hit yet. Second, the practice dummy has such absurdly high armor values that testing against it often results in damage being reduced to zero (for which the game gives you a consolation prize of 1 damage). The best method I could come up with was this: I started a new character a made my way to the path of the honored dead where monsters are level 4 (at least for me). The low level results in a low armor, which in turn results in a narrow range of damage reduction, which allows testing to proceed without requiring a huge number of samples. Console "levelup 99" to get access to any skill I want to mess with and to equip any item. Console "aifreeze" to make the monsters hold still. Console "unit bandit_assassin" to spawn a bandit assassin to spawn an unlimited supply of guys to hit. I picked the assassin because he's supposed to have flat 100% armor across all types. Use console to spawn weapons as desired. Axes are preferred because they have no damage range to muddy up the picture. Start with a plain no-mods physical axe, then work up to more complicated weapons. For each sample, look at the combat log and subtract the "post" value from the (bonus modified) damage roll (the number on the right of the arrow). 2. Getting from .dat to actual damage reduction. This one is a bit of a head-scratcher. ARMOR_MONSTER_BYLEVEL_VERYHARD.DAT says that level 4 monsters are supposed to have 15.14 armor. BANDIT_ASSASSIN.DAT says that bandit assassins are supposed to have 100% normal armor for all armor types. The observed range of damage reduction against the plain axe was 9-17. I don't really have a good theory for this discrepancy. (Uh... the monsters are really level 4.5?) If anyone is able to figure out where that extra 2 points of armor came from, please let me know. For weapon-DPS-based skills that do less than 100% weapon DPS, monster armor is scaled by the same percentage. To replicate: While equipped with your plain axe, use a skill with really low WDPS at early ranks (rank 1 Chain Snare is a good example) and compare the average damage reduction to the average reduction from normal hits with the plain axe. 4. Another unexpected result: Monster armor scales on secondary targets. The armor on monsters taking splash damage from non-claw melee weapons (i.e., secondary targets) is getting scaled down by something -- presumably your damage-to-secondary-targets percentage. To replicate: Spawn two bandit assassins on top of each other; whack with plain axe. When you hit with a weapon that does multiple damage types, the monster's armor gets pro rated across the various damage sources. The pro rating is done in proportion to the post-roll, fully modified damage for each type (rather than the pre-modifier roll, or the pre-roll min/max/avg). To replicate: This is best tested by using wands/staves with equal bases for all four elements. Each element will be reduced by 1/4 as much as your plain axe hits were. The Beast with a Million Eyes demonstrates that the base physical damage is also subject to pro rating (but see below). Adding items like 2x Ratchet Ring to boost one particular element will show that the pro rating cares about the final, post modifier roll. If the weapon does base physical damage, this gets reduced by more than it should. To be precise, it looks like double. This appears to result in more than 100% of the monster's armor getting applied. Example: A Four-Bearded Axe socketed with 3x Iron Ember Chip does 114 base physical and 105 +physical (yes, they get separate lines in the console even though they're both physical). That was as close as I could get to what should be a 50/50 pro rating. It's not. The base physical is subject to the exact same reduction range as the the plain axe (double what was expected), while the reduction applied to the +dmg from the socketables is about half what the plain axe had (as expected). The sum result is that ~150% of the monster's armor gets applied! Another example: Mountain of the Cannibal ****. One would expect the reduction applied to the poison to be ~1.5x bigger than the reduction to the base physical, but the reduction to the base physical is actually slightly larger. Adding points to focus and/or poison_dmg% gear can eventually flip this over, but the reduction applied to the base physical stays higher than the ratio between the damage types would indicate. I only tested Wolfpack, but I assume the others (like Emberquake) work the same. It's hard to tell because the console reports poorly on flat damage skills, but it looks like the two components are treated as separate hits that are each subject to the monster's full armor. Also, if the flat component (against, just tested Wolfpack) is sufficient to kill a monster, the WDPS component doesn't happen at all. This is a long-overdue companion article to the classic [How Stuff Works] Damage by Armis. This is the understanding of Torchlight 2's defensive mechanics that I have been able to assemble through empirical testing. I've tried to test everything, including re-testing a lot of things that are "common knowledge" (some of which turned out to be wrong). Where I didn't do the testing myself, I try to provide a link to the thread where the testing was done. If you successfully kite an attack, you take no damage, so stop here. Otherwise, continue to the next step. If you successfully reflect an attack via missile reflect, you take no damage, so stop here. Otherwise, continue to the next step. If you successfully dodge an attack, you take no damage, so stop here. Otherwise, continue to the next step. Armor cannot reduce damage below 1, so always continue to the next step. Damage reduction cannot reduce damage below 1, so always continue to the next step. Even if all the damage from an attack is absorbed, it is still checked for block, so always continue to the next step. If you successfully block an attack, you take no damage, so stop here. Otherwise, continue to the next step. If any damage remains at this point, it is deducted from your health total. If your health is reduced to zero, you die. “Kiting” refers to the act of moving your character before an attack lands so that it fails to hit. Players coming from Guild Wars 1 should be familiar with the concept. By contrast, this concept may be new to players coming from Diablo 3, where all attacks will land if the target was in range when the attack started. Kiting is not an “official” part of the defensive mechanics. You don’t have a “kiting” entry in your Arcane Statistics panel. It is nevertheless your first line of defense, and also one of the most important. Missile reflect causes a missile attack to bounce off of your character, dealing no damage. If the bounced missile hits a monster, it deals damage based off your weapon DPS. Sometimes missile reflect is “aimed” directly at the monster that attacked you; sometimes the direction of reflection is random. I’m not sure what controls this. The chance to reflect missiles from multiple sources stacks multiplicatively, not additively. The easiest way to calculate this is to compute your chance to get hit by multiplying together your chance to get hit with respect to each missile reflect source, then subtract from 100%. When a reflected missile hits a monster, it deals damage based off your weapon DPS, identical to a skill that says it deals “X% of Weapon DPS,” except that it can fumble. See [How Stuff Works] Damage for how to compute damage for skills that use weapon DPS. Reflected missiles do not build charge. and R is the total chance to reflect missiles from all sources (explained above). Items. Of particular note is Zardon’s Mighty Skull which is a level 100 unique socketable that gives 25% missile reflect. Dodge stops all damage from a dodged attack. Chance to dodge is capped at 75%. The scope of things that can be dodged is rather narrow. The most extensive testing that I am aware of was done by forum newcomer Squiggler, who concludes that you can dodge (1) melee autoattacks, and (2) non-aoe ranged autoattacks; Skills can never be dodged. It’s worth noting that the scope of things that can be blocked is significantly broader than the scope of things that can be dodged. Some basic mathematics about dodge are poorly understood by the overall TL2 community, so I’m going to summarize them here: The survivability benefits of dodge are inherently escalating. So each point of dodge chance is more valuable than the one that came before it. At 1% dodge, 99 blows in 100 will land. At 2% dodge, 98 blows in 100 will land. Going from 1% to 2% results means you get hit ~99% as often. At 98% dodge, 2 blows in 100 will land. At 99% dodge, 1 blow in 100 will land. Going from 98% to 99% means you get hit half as often. If you can survive for an average of 60 seconds without heals at 98% dodge, then you'll survive for an average of 120 seconds without heals at 99% dodge. You can read more about this in this classic thread by Rokiyo and oneOverZero. 75% dodge will improve your survivability (as measured by how much raw damage the monsters must dish out to kill you) by 4x. 75% dodge will improve your survivability by twice as much as 50% dodge (4x vs. 2x). Dexterity gives dodge chance according to the formula “Dodge_Chance_From_ Dex = Dex * (0.2002 – 0.0002 * Dex)” up to a cap of 50.1% chance to dodge at 500 Dexterity. Dodge chance is available as an item modifier. 1% Dodge chance is available on the unique socketable the Eye of King Pogg. Dodge chance is available as an enchantment from the elemental oasis enchanter on some items (e.g. shields). Dodge chance is available from various skills. Dodge chance is available from the Outlander charge bar talent. Armor subtracts a flat integer amount from incoming damage. The amount subtracted is a random amount between 50% and 100% of your armor value. Depending upon whether the attack that hits you is physical, fire, ice, electric, or poison, your corresponding armor value will be used. If armor would reduce incoming damage to 0, it is reduced to 1 instead. Armor comes primarily from items. It is also available from some skills (e.g. Berserker’s Shred Armor skill). Vitality increases armor by 0.25% per point of Vitality. The “Armor Expertise <X>” spell scrolls increase physical armor, up to 24% from the “Armor Expertise VI” scroll. Several skills (e.g. 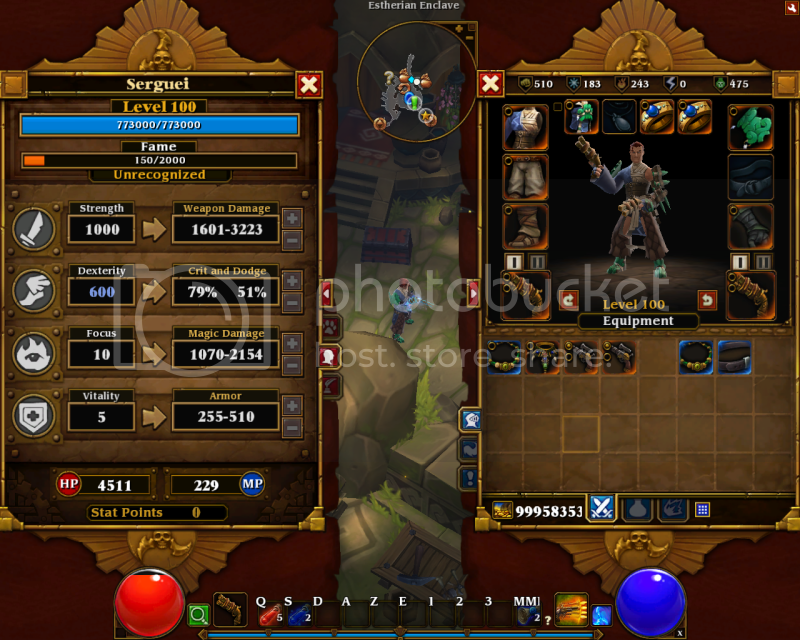 Engineer’s Bulwark skill) increase armor on a percentage basis. Damage reduction reduces incoming damage by a percentage amount. It applies after the incoming damage is reduced by armor. Damage reduction is capped at 75%. If damage reduction would reduce incoming damage below 1, it is reduced to 1 instead. Berserkers and Engineers have an inherent 25% damage reduction. Damage reduction is available from a number of item modifiers and item enchantments. Most notably, the Eye of Grell, which is available as a drop from General Grell halfway through Act I, is a socketable that gives 3% damage reduction (all types); and the Skull of Limoany, which is available in any area that can drop level 62 items, is a socketable that gives 5% damage reduction (all types). Some skills give damage reduction. Most notably, the Embermage’s Immolation Aura gives 15% damage reduction (all types) at max rank. Damage absorption is a unique mechanic that is only available from the Engineer skills Forcefield and Aegis of Fate. Damage absorption applies after the incoming damage is reduced by armor and damage reduction. Assuming your forcefield/aegis has adequate hitpoints, damage absorption negates all incoming damage and your forcefield/aegis loses that many hitpoints. If your forcefield/aegis does not have enough hitpoints, an amount of damage equal to the forcefield/aegis’s hitpoints is negated, the forcefield/aegis is destroyed, and the remaining damage is applied to your health. Even if all the incoming damage is negated, the zero-damage hit is still passed on to the next step for a block check. If both Forcefield and Aegis of Fate are active, whichever one was activated first will apply first and absorb the incoming damage. The overwhelming majority of the time, Aegis of Fate will get activated first, because an active Forcefield usually prevents you from taking the damage necessary to activate Aegis of Fate. In the rare cases where Forcefield is activated before Aegis of Fate, if you recast Forcefield before it expires, it will continue to count as having been activated before Aegis of Fate. Sources of damage coming up from the ground (such as standing in fire) generally bypass your forcefield/aegis. Block stops all damage from a blocked attack. You must have a shield equipped in order to block. Chance to block is capped at 75%. The mathematics of block are identical to those of dodge. Please refer to the description of dodge above. Vitality gives block chance according to the formula “Block_Chance_From_ Vit = Vit * (0.2002 – 0.0002 * Vit)” up to a cap of 50.1% chance to block at 500 Vitality. Block chance is available as an item modifier, particularly on shields. Block chance is available as an enchantment on shields from the general, master, and grandmaster enchanters. Block chance comes as a benefit from the “Blocking <X>” spell scrolls, up to 12% from the “Blocking VI” scroll. You begin the game with 200 health and gain 40 health per level. Vitality gives 3.6 health per point of Vitality. Health is available from a number of item modifiers and item enchantments. Most notably, Skull of Riechliu, which is available in any area that can drop level 73 items, is a socketable that give 1540 health. Earlier in the game, blood embers are a good source of extra health. When your maximum health changes (for instance, if you hit the ‘W’ key to switch to a weapon set with a smaller health bonus), your current health does not change, unless it exceeds the new maximum (in which case your current health is reduced to the new maximum). Therefore it is not possible to end up in the “negative health” state that is possible in some other games such as Guild Wars 1. This is a rare mechanic that is available from a small number of item modifiers and item enchantments, usually on amulets. It can also be found on the rare unique socketable Lito Inso's Lens. When triggered, you are automatically healed to full health over a very short period of time. The heal occurs after the health loss from the attack, so you must have enough health to survive the attack to gain the benefit of the full heal. There are two types of damage reflection, both of which deal damage back to a monster that damages you. Damage reflection does NOT reduce the amount of damage you take; it only makes the monster take damage too. Percent damage reflection deals a percentage of the damage a monster did to you back to the monster. The amount of damage dealt is based on the actual amount of health you lost. It does not scale with anything else. Obviously, percent damage reflection will only trigger if you actually lost health as the result of an attack. Damage reflect will not trigger if an attack kills you. 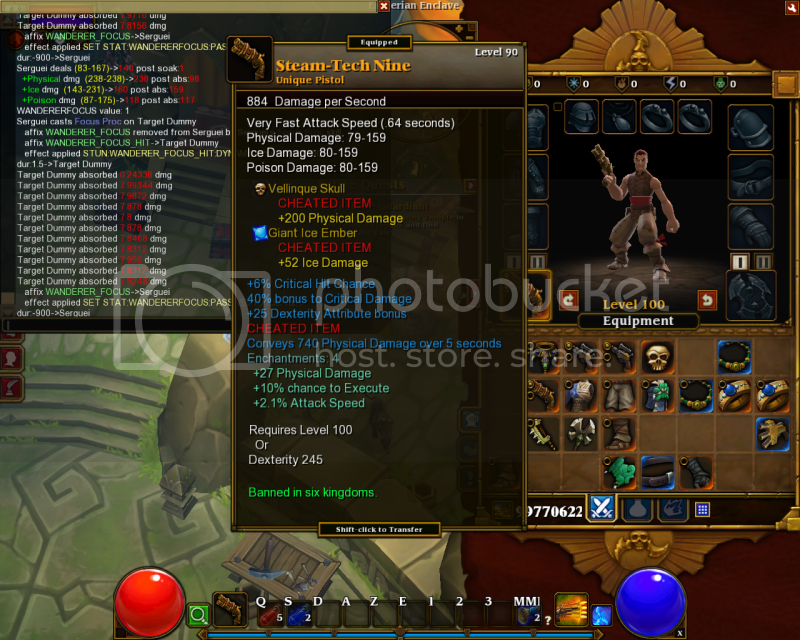 Integer damage reflect is available from items. Percent damage reflect is available from skills (Embermage’s Ice Prison and Outlander’s Stone Pact) and the “Retribution <X>” spell scrolls. In TL2, as levels increase, the amount of damage monsters deal grows much faster than player health and armor possibly can. This trend is especially pronounced on Elite difficulty level. As a result, you are required to devise a defense that can survive a steady stream of potential one-hit kills. Early on, before this trend becomes pronounced, many things may work to keep you alive. Over the long term, however, there is one, and only one, strategy for dealing with the constant threat of being one-hit killed: Avoid getting hit as much as possible, and, when you do get hit, rely on percentage damage reduction to make the hits survivable. Collectively, the mechanics that cause you to take no damage at all from an attack -- kiting, block, missile reflect, and dodge -- are the second-most important defensive measure. Dodge falls somewhat behind the other three because its scope of coverage is inferior to block’s. The third-most important defensive measure is extra health. This is not because it’s an inherently strong mechanic (it’s not), but rather because Skull of Riechliu allows you to increase it so dramatically. Armor is basically meaningless. Not only is it badly outscaled by monster damage, but its effectiveness is also reduced by any damage reduction you have. 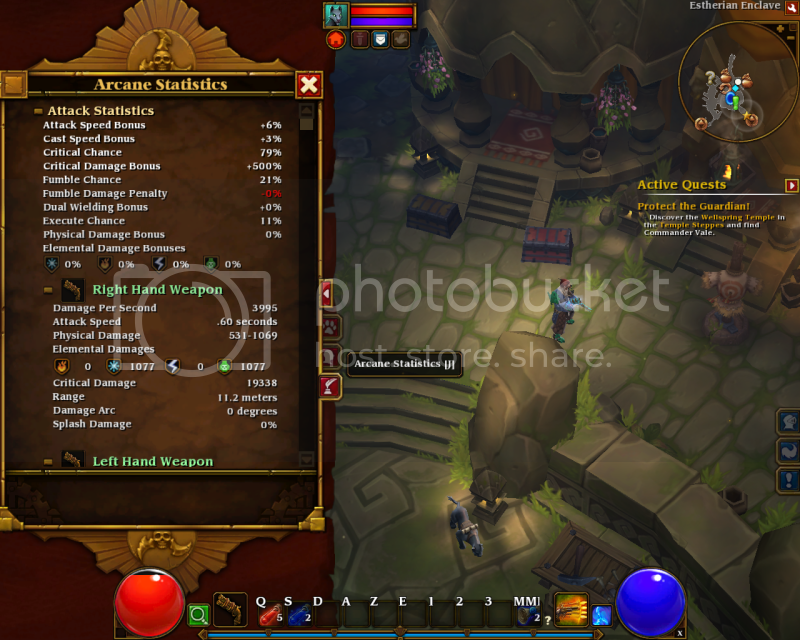 All in all, there is some satisfying depth to Torchlight 2's defensive mechanics. Even though damage reduction is clearly dominant, most of the other mechanics are both meaningful and necessary, creating a fun min-maxing problem. The presence of kiting keeps things interesting by making player skill a big factor in survivability. The most important defensive stat, damage reduction, is ridiculously hard to obtain. It's only available as an inherent modifier on a handful of items, most of which are unique rarity; and from two unique socketables, with the better one having a pretty ridiculous level restriction on where it drops. The system is opaque. An objective observer studying the UI for hints would likely conclude that armor is the main defensive mechanic. And that objective observer would be dead wrong. By the same token, an objective observer studying the UI would be hard pressed to find any clue that damage reduction is extremely important. With the introduction of Tarroch's Tomb, there are now a few monsters that pretty much require a shield (or a big range advantage) to survive. This puts too big of a crimp in build diversity. This problem could be solved by broadening dodge's scope or introducing a new parry/weapon block mechanic with a wider scope. Damage absorption applying before block is kind of a kick in the nuts for Engineers. The issues with armor and damage reduction are the biggest problem. To be honest, they call for a total redesign that would give armor some kind of percentage reduction effect (and probably change damage reduction into an integer reduction applied after armor). A "band-aid" solution would be to change the order of operations so that armor applies after damage reduction. (To avoid unbalancing things on the damage dealing side, damage reduction would need to be split off from damage increase effects like Howl, or those effects would also have to give their targets a corresponding armor boost.) This would at least make armor meaningful, if still not anywhere close to being the main defensive mechanic. I've been trying to make sense of the backstory of Hob, which is conveyed mainly through pictograms in the 5 sword caves on the world map. Here is what I've pieced together. Feel free to make your own observations. I don't remember what order the caves came in (they had to be unlocked sequentially as you leveled up your sword), I've put them in the order I think makes sense for this story. Cave 1 (Center of the map): Hob's people, led by the Three, lived underground on an artificial world, for the sun was dying. The Three in the Tower watched, and waited, and when the energy of the sun could not be gathered any longer, they gathered all people near the tower and put them in stasis to prepare for the long journey. I believe (based on the next cave) that the whole world was the vessel on which they traveled, with the tower being the command center. Cave 2 (Bottom of the map): The journey through the starless void felt an eternity to the three watchers, though their charges slept dreamlessly. It was not, however, for at last starlight illumined the tower again, and the worldship opened like a flower to receive it. The symbol that "moves" left to right in this cave is the one that represented the world in the last cave, but in miniature. The symbol that lights up last on the right is the save logo of the game as well. The symbol in the upper right is the new sun, and it shows up again in the next cave. Cave 3 (Top of the map): The Three stretched in the unfamiliar light. They had work to do - a world to make ready for their people. They input their commands, and the world itself started moving. Lands long underground moved towards the light as the mechanical Helpers, reactivated, shepherded the world towards a new dawn. Note the sun symbol again. Cave 5 (Right of the map): This depicts the war between the Blight and the Helpers. The Helpers modified themselves for war and threw themselves against the Blight, for their directive to prepare the land still had not been carried out. But the Blight was too strong, and even the Helper's colossi could not avail them. Here the Hob prequel starts. A dead Helper, given new life by the [rogue?] sprites, begins awakening the people one at a time, in the hopes that they could succeed where the Helpers had failed, and make the world a home fit for their brethren again. Re: Do swords automatically upgrade after smelting? How do I destroy hives? And two trophy questions. 1. sword is upgraded automaticaly, I do not know about method to switching between swords level. You only have the highest level possible. You are smelting three pieces of sword and old one together. 2. Hit the bug watching out from hive entrance, after that he goes inside hive and explode.